Although Lag Ba'omer has passed, a few final thoughts on the day are still in order, as we are taught that the three days following a yartzeit are considered to be a part of the yartzeit, as well. The question is widely asked: Why is it that the 7th of Adar, the yartzeit of Moshe Rabbeinu, is observed with somewhat of a mourning flavor, while Lag Ba'omer, the yartzeit of Rabbi Shimon Bar Yochai, is a day of celebration and festivities? Among the many answers which I saw while perusing "Kuntres Lag B'omer B'halacha U'vaggada" there were a few which piqued my interest more than others. For one, Moshe Rabbeinu represents Torah shebektav, the "written" and "revealed" Torah, while Rabbi Shimon Bar Yochai represents the "oral" and "hidden" Torah. It is explained that according to kabbala, the yartzeits of tzaddikim who are associated with the written Torah should indeed have a mourning flavor to them, while yartzeits of those associated with the oral and hidden Torah should be celebratory in nature. Another reason cited is that Rabbi Shimon Bar Yochai specifically promised that he would advocate in Heaven on behalf of klal yisrael every year on his yartzeit and to have them saved from every trouble and woe. Since we are confident that Rabbi Shimon will certainly be successful in his mission, it is a day worthy of celebration. Another difference between the yartzeit of Moshe Rabbeinu and that of Rabbi Shimon Bar Yochai is reflected by what occurred on the day each of them died. On the day of Moshe Rabbeinu's death, three thousand halachot were forgotten from klal yisrael which in itself is grounds to mourn. However, on the day that Rabbi Shimon Bar Yochai died, three thousand halachot were revealed and renewed – certainly a cause for celebration. It is also the day on which Rabbi Shimon Bar Yochai received semicha from Rabbi Akiva. 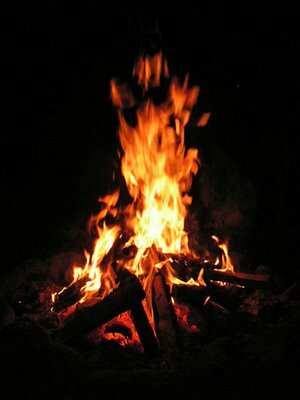 A further connection between Moshe Rabbeinu and Rabbi Shimon Bar Yochai are the bonfires which are so prominent on Lag Ba'omer. It might just be that the bonfires are also intended to recall the burning bush, which offers a continual and visual reminder of the connection between Rabbi Shimon Bar Yochai and Moshe Rabbeinu. It is also noted that Lag Ba'omer is also worthy of celebration as it is the day that the Manna began to fall and sustain the Jewish people for the forty years they were in the desert. And finally, my favorite: There is a well known teaching that Rabbi Shimon Bar Yochai was the reincarnation of Moshe Rabbeinu. Lag B'omer represents the miniscule fulfillment of Moshe Rabbeinu's longing to at least be buried in Eretz Yisrael. Through Rabbi Shimon Bar Yochai, Moshe Rabbeinu was able, to some extent, to be buried in Eretz Yisrael.